You didn't think I'd tell you I learned all about Comté cheese without any explanation, did ya? Read on. It all begins with the milk producer - the Montbéliarde cow. Each cow has two hectares of natural pasture to graze on in the summer, and is fed local hay in the wintertime. They are also milked twice a day. Daily, the farmer brings the fresh, raw milk to a frutiere. 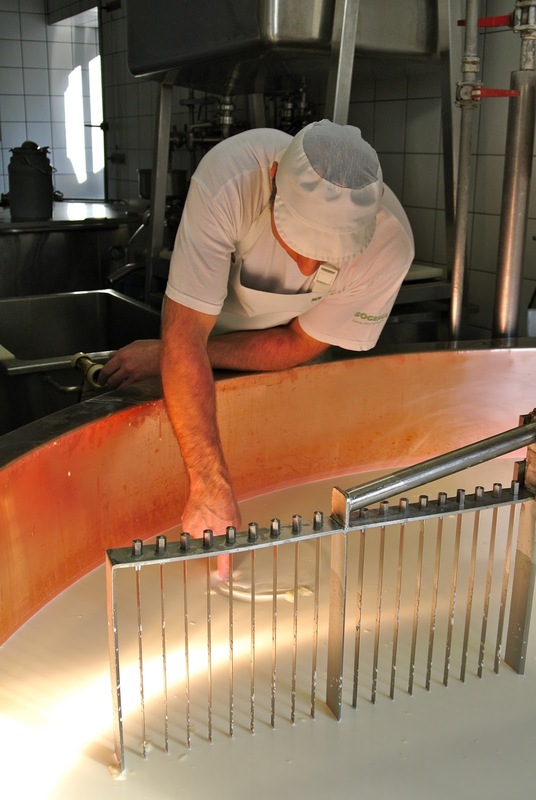 This is where the cheese itself is formed; first by cleaning and combining the milk of Montbéliarde cows from about six different farms. A cheesemaker then partly skims the milk, curdles it, extracts the whey, and forms a round, white mould. His/her touch in conjunction with various machines is incredibly important throughout each step. Once cheese wheels, they're brought to an affineur to begin the delicate, 4-18 month aging process. 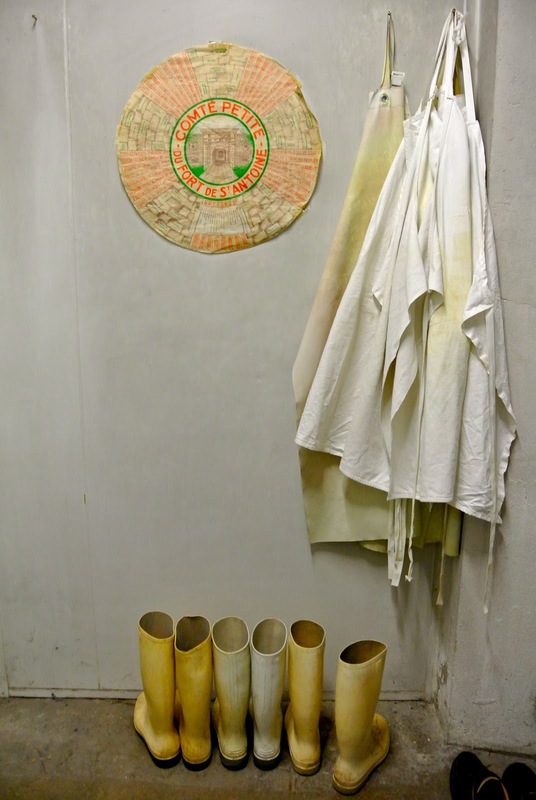 The wheels are stacked on spruce boards in distinctly humid cellars. About three times a week, they are rubbed with salt and turned over. This is when the rind forms naturally (from the fermentation of microflora in the cheese and on the wood) so the cheese ager has to closely watch each one as it matures. How does s/he know when its ready? Knocking on it, literally. The sound informs the cheese ager whether there are any breaks within the wheel which would suggest it's at it's maturest point and ready to be enjoyed. It's amazing to think we followed the actual process, though not in the sequential order due to convenience. More fun facts from the book our taste educator, Claire Perrot, published: each Comté cheese wheel weighs 40kg; a 30g serving of Comté contains 15% of an adult's daily protein needs; there's only 8g per kilo. We learned how to taste Comté, too; using our senses of sight, smell, and touch first, then taking note of the aromas as we tasted. As in tasting wine, there's a poetry to the language used in describing the experience. I'll admit I've tired of Comté after having enjoyed countless pieces of old and new, summer and spring, fruity and nutty cheeses. But, I will forever appreciate it. There is so much passion and dedication that goes into its creation. I couldn't help but fondly remember my visit to a Wisconsin dairy farm and how different the conversations were there. Even though the U.S. doesn't have these traditions of terroir, I'd like to think we can still cultivate an appreciation for local and artisan foods. Hopefully we're already on our way.